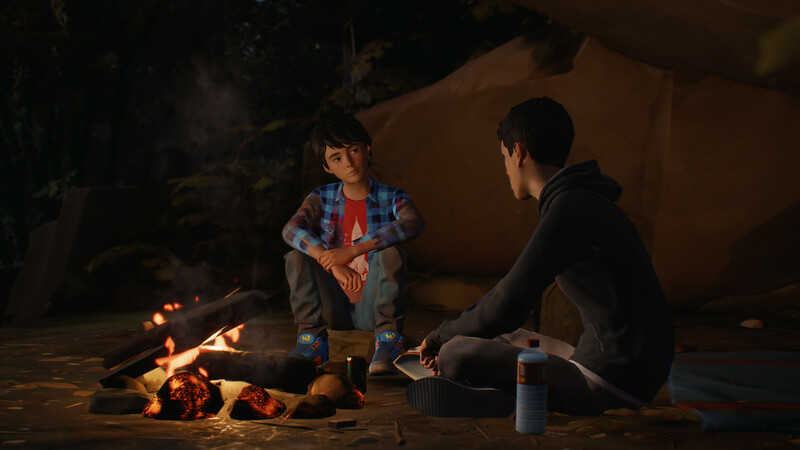 The first episode of Life is Strange 2 took a particularly honest view of racism and racial issues. The reaction to it has mainly been positive. However, the plot of the game has also brought some bizarre reactions. Especially compared with the successful of the very safe prequel. There has been the usual boycotts and complaints about diversity being forced on players. There’s also been some attempts to explain how the game is not condemning racism. Complaints about right wing people (specifically people who hate Mexicans for being Mexican) being portrayed in a negative light. It’s as baffling as a game about killing Nazis being controversial over upsetting Nazis. For anyone lucky enough to have never seen it, The Right Boycott is an offshoot of everyone’s favourite terrorist-attack organising subreddit, R/The_Donald.It handily compiles lists of which brands you should boycott to avoid giving money to those not on the far far far right. Scrolling down the whole list, its pretty exhaustive. 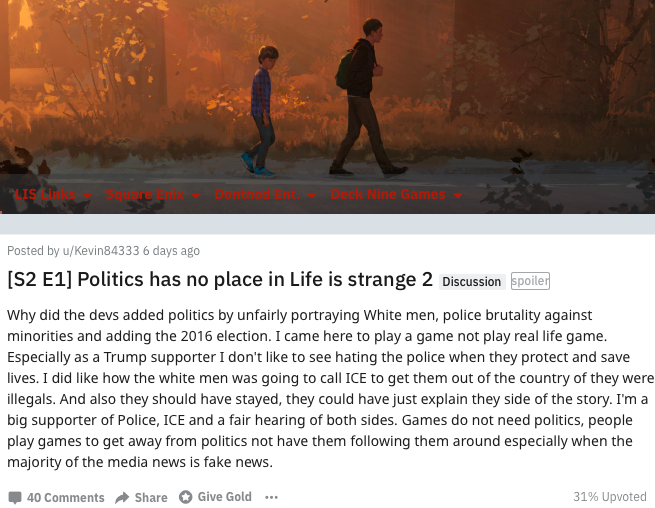 Life is Strange 2 has of course been earmarked for boycotting. Most of the replies seem to not be aware of the game or wanting to buy it in the first place. These replies are fairly typical, but most in this fringe subreddit aren’t particularly interested in the game in the first place. Frankly, if you read the entire list it becomes clear that no one is actually sticking to their word on this sort of stuff. The reaction from gamer based communities, those who are interested in the game, has been just as bad. This is not the only example of this kind. There are others,and others, and others,and others,and others, and yeah quite a lot really. Most of these take issue with a Trump voter being portrayed as a bad guy. In this context, the Trump voter part of it just means racist. The political views of this Trump supporting character is that he hates Mexicans. How has it reached it a point where making a racist a bad guy is strong political bias? The protagonists are Latino, the bad guy character is a racist. Surely the relationship between the two should write itself from there? This one particular racist also kidnaps two children, imprisons them, and kicks one of them in the head for being upset that he was kidnapped. Is this some strong political message that people who kidnap children should be upset about? The proud group of child-snatchers in todays society should be organising their own boycott. If racists are unhappy about being tarred with the child-snatching brush, then child-snatchers should be upset to be tarred with the racist brush. Life is Strange 2 insults both. Not all Kidnappers! That could be their slogan, not all kidnappers are racist. This is a particularly ridiculous example but it is the same general argument that’s spread elsewhere. Now that the protagonists are not white, it is no longer a coming age story. These people equate the game to political propaganda, because they cannot associate or emphasise with people of different races. The game is still a coming of age story, and frankly there’s a lot of mystery going on at the moment too. It gives the impression that the first Life is strange went entirely over a lot of peoples heads. 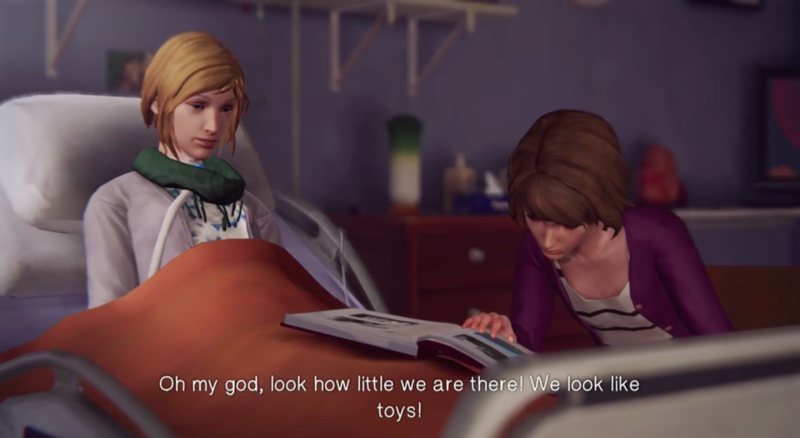 The first Life is Strange was equally politically charged. The entire thing with dripping with class politics. Attending the prestigious private school full of rich kids, the contrast between this and the rest of the town’s population. The Prescott family pretty much owning the dying town. David’s PTSD and tendencies towards the totalitarian. The alternative universe plot of the bankrupting effect of health care costs. This literally involves a teenager committing suicide over the finical impact of her disability on her family. There’s also the whole saga of Katie and the impact of victim blaming. Not to mention the entire game was constructed around climate change. Did these people skim completely over these sections of the game? Was it a choice to ignore this blatant subtext to make the game fit into their narrow world view? The first game was just as outspokenly political. Did these people not pay any attention to the game or are they incapable of perceiving the meaning of a game beyond what is literally spoken over and over again? You’re not always going to agree with the political subtext in culture you enjoy. You shouldn’t only partake in culture entirely within your own bubble. If your views can’t hold up to a little dissenting opinion, then maybe you’re too fragile about them. If a game with a non-white protagonist makes you so uncomfortable it can only be political propaganda, you must have a sheltered existence. When a negative portrayal of a racist upsets you by not respecting the views of a racist, then you should probably not speak to anyone outside of 4Chan about your views.